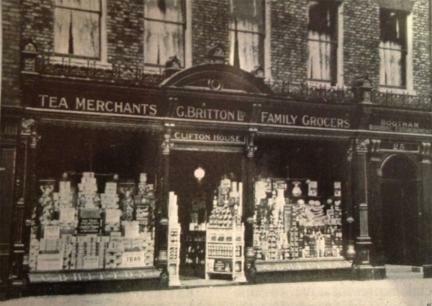 Following on from the discussion on this shopfront and its history, here’s a photo I’ve been sent, thought to date from the 1880s, showing the shop when it was G Britton Ltd, grocery and tea merchant. The photo can be enlarged. If you’d like to compare with how it looks now – click here. In the 1893 directory George Britton of 25 Bootham – ‘grocer & tea dealer & provision merchant’ – has other businesses listed, at 56 Low Petergate and 96 Micklegate. The Bootham street listing continues with Robert Kirk, fruiterer, at 27½, before number 29, Robert Hide, beer retailer, presumably the pub which still exists. Where the door for 27½ was is anyone’s guess. Anyone who has researched local history has no doubt come across the often rather baffling street-renumbering phenomenon. This appears to have happened on Bootham, more than once. An earlier directory (1885) has Britton’s grocers at number 9 Bootham, after John Allison, saddler, at 8½. Those ‘and a half’ in the street numbering look odd now, but seem to have been quite common. The door to the right, which now leads to flats, but previously led to the Roxy nightclub, at this time led to ‘Bootham Boarding Establishment’, according to the lettering above the door. A 1913 directory has George Brown’s boarding establishment and Britton’s grocers at number 25, and the building also recorded as Clifton House. 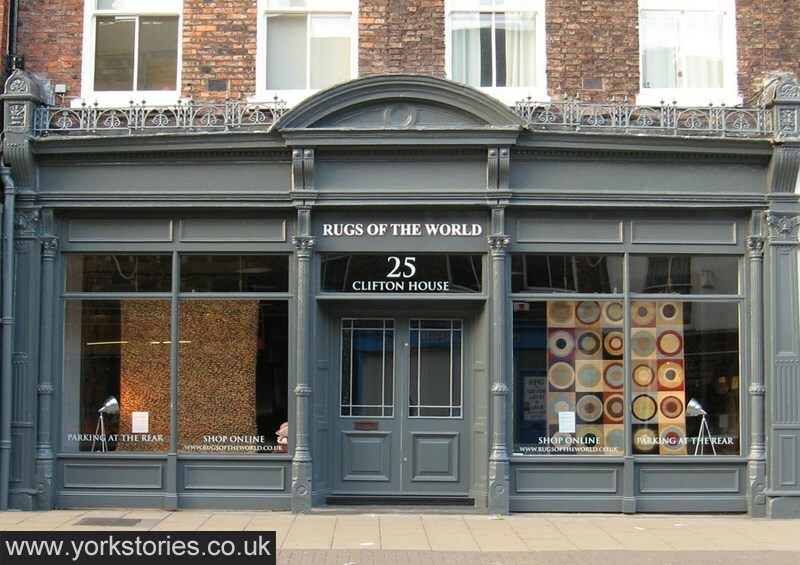 There’s another grocer listed at number 27, before the beer retailer/pub. On the other side of Britton’s, there’s a number 23A. Incidentally, the confusion over numbering continues. According to the council’s planning department, this is 27 Bootham. The 1823 directory doesn’t include numbers, just the street name. These old directories make fascinating reading, and conjure up a bygone age, with its various trades. Somewhere on Bootham lived Henry Chapman ‘preserver of birds and quadrupeds’. It’s not possible, I think, to link to the relevant pages, but the information above came from the excellent Historical Directories project. See all comments on ‘’Impressive Frontage Refused’’of the 19′th June 2012.It is quite startling to me ,to see this photo from the 1880’s,with the shop layout looking like the one I visited in the early 1950’s,and looking thro’ right and left windows,the interior layout being almost the same ,as 70 years earlier,only the shop name seemed to be changed. It certainly seems to have an impressive range of goods for sale – so much so that extra shelving occupies the doorway!